We generally think of the average height of the ocean as being a height of zero. This is because it can be useful to know how far something is above or below sea level, which is a vertical datum. It is a convenient reference height that is easy to access on the ocean or near a coastline. It may surprise you to learn that the height of the Atlantic Ocean on the east coast of North America is more than 50 centimeters (or 20 inches) lower than the height of the Pacific Ocean on the west coast. Only over the last 40 years have we been able to accurately measure these differences in height with the use of satellite altimetry and satellite navigation like GPS, or more generally Global Navigation Satellite Systems (GNSS). These differences in average ocean height across the world’s oceans are commonly referred to as Dynamic Ocean Topography (DOT). DOT occurs for a number of reasons but the largest factors that cause it are the ocean’s currents, and the ocean’s temperature and salinity. One of the more pronounced examples of DOT is the Gulf Stream Current. In a 100 kilometer cross section of the current there is a height change of around 1 meter. This is referred to as a geostrophic current, the slope of the water arises to create a pressure difference that balances with the coriolis force due to the moving water. Salinity and temperature affect DOT because they control the density of water. When you warm up water it expands; the volume will increase but the mass remains the same. Near the poles there is colder water and near the equator, because of heating from the sun, the water is warmer. This causes the relative height of the water near the equator to be higher than at the poles. Historically, for most surveying applications we didn’t need to know the absolute height of the oceans. You can set up a tide gauge and get a good estimate of the local mean sea level. And unless you do something crazy (like take that height across a continent, which is the short story behind the Sea Level Datum of 1929) you won’t have to deal with the fact that ocean heights can be different. 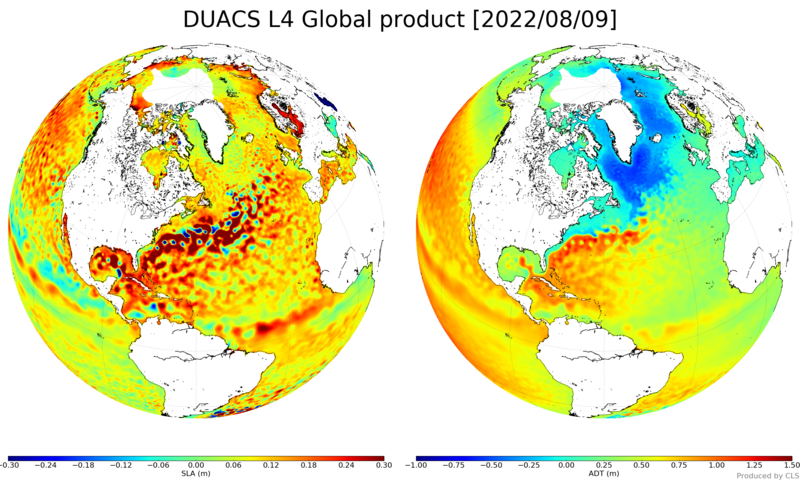 More recently, measuring sea surface heights and modeling DOT have proven valuable to understanding global ocean currents (remember geostrophic currents, if there is a slope there is probably a current), improving models of the earth’s gravity field, and to more accurately define continuous vertical datums for use with GNSS/GPS. That last one is where my interest comes in. My research is related to an investigation of the use of continuous vertical datums for relating GNSS/GPS heights to tidal datums. DOT plays an important role in being able to model the separation not just at single locations, such as tide gauges, but everywhere. This will be the first of a five post series discussing DOT, its importance to mapping, and more details about what causes it. If you are curious to learn more here are a couple resources to get you started. What is new in dynamic ocean topography?